The Sangam platform was designed to train municipal functionaries of state sanitation missions, city managers - engineers, administrators, field supervisors and sanitation workers with an aim to equip, assess, measure and accredit the training of these officers. 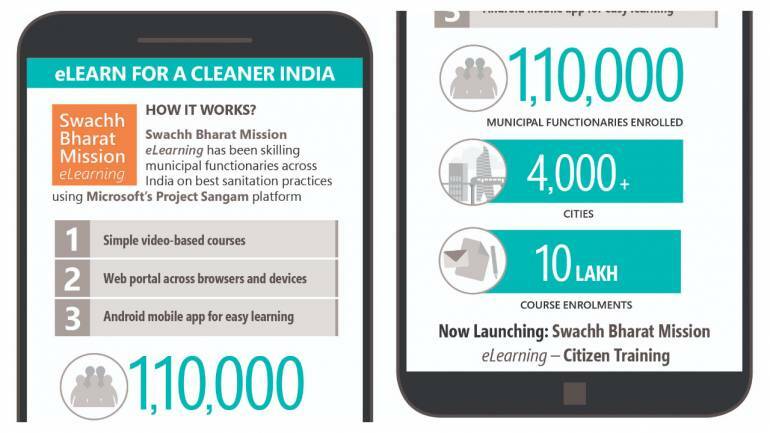 Microsoft India has partnered with the Ministry of Housing and Urban Affairs (MoHUA) to deploy Project Sangam to train functionaries and officers across India on its Swachh Bharat e-Learning Portal. Through this partnership the MoHUA has augment learning on this cloud-hosted, mobile-first community learning platform train more than 110,000 municipal functionaries on best sanitation practices across 4,000 plus cities in India. To successfully execute the Swachh Bharat campaign, MoHUA wanted to standardize, centralize, modernize, and establish systems for knowledge exchange and capacity development to train thousands of municipal functionaries spread across cities in India. Through Project Sangam, the MoHUA can run custom community training courses for and track their process, manage content, users and analytics across the program in one place. It also provided video-based learning for users who have low-bandwidth supporting offline learning for the Swachh Bharat e-Learning Portal users. In the phase two of this Swachh Bharat e-learning mission, the ,inistry will now roll out its Citizen Training program with an aim to train the citizens of India on subjects like public toilets hygiene, waste management, household hygiene and sanitation practices.